Frocks at Open Streets – next Sunday 12th April! Cycle Action is teaming up with Auckland Transport’s Open Streets 2015 to bring you Auckland’s first bike gang competition. 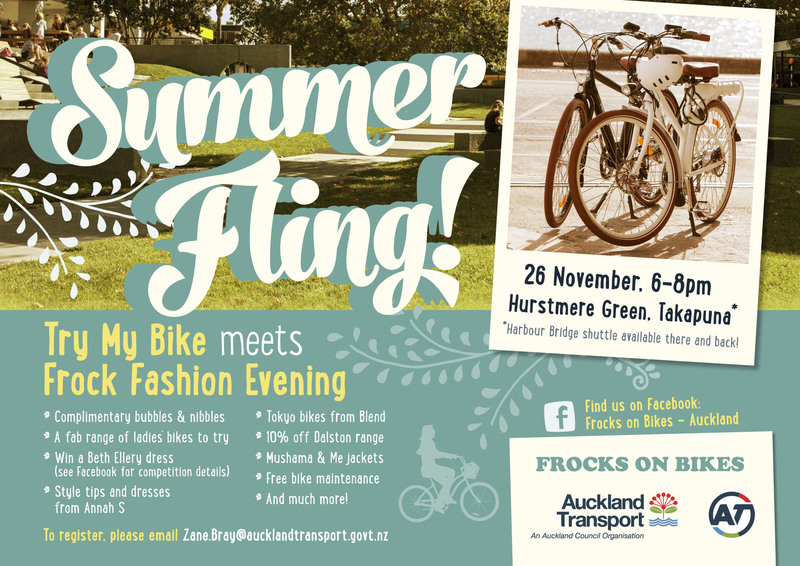 Frocks on Bikes are showing up in force to compete for the title (and all the glorious prizes) of Auckland’s best and biggest bicycle bunch! Entry is easy – next Sunday 12th April, just meet up at Tokyo Bike dealer Blend Store in MacKelvie Street, Ponsonby from 11.30am or at St Kevins Arcade at 12.30pm for the group ride along to and down Grafton Gully and Beach Road to Quay Street. We’ll get registered at the CAA tent around 1pm and then enjoy some free sushi at the Frocks tent. In conjunction with Japan Day events on at The Cloud on Queens Wharf, come with bike in your best Japanese cosplay. Be it a variation on a kimono and frilly socks + sandals, Shibuya chic or your favourite manga character, this is your event to dress in theme! Hope you are all revelling in this delightful summer! Bar today, may we all have many more glorious twilight and warm morning rides to come. To celebrate freedom on two-wheels, we have some fun events coming up to keep you rolling in style. EcoFest is on the North Shore this year and to support sustainable transport to / from the North Shore in advance of (toes-crossed) SkyPath, we thought it would be fun to organise a ‘ladies who lunch and ride’ event to / in Milford. There are a few new eateries there to try, a shopping mecca if you like shoes and there is the added bonus of a swim so we’ll keep you posted on tides. Date is Sunday 22 March (rain date 29 March). The plan is to ride onto the 11am downtown ferry to Devonport and pick up ladies on the way, then follow the quieter Sunday roads to Takapuna, then on a smidge to Milford. EcoDay to celebrate the end of EcoWest (separate from EcoFest) – if anyone is keen to host a stall or do something cycle-related in New Lynn, please get in touch. We are also very excited to announce Allison Roe (former Boston and NYC marathon winner and now Devonport – Takapuna Local Board member whose is passionate about cycling for all), as our guest speaker! And if that’s not enough, there is a free drink or two and yummy nibbles with many thanks to Auckland Transport to keep your energy up. 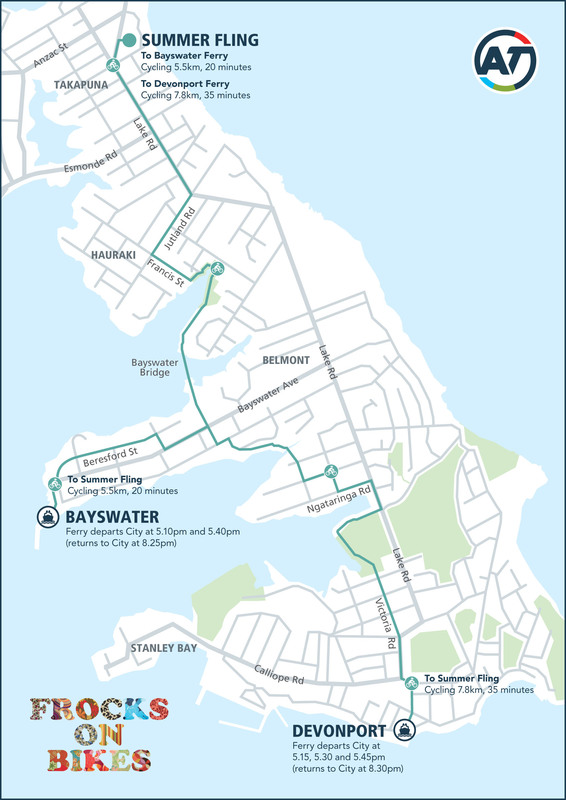 For those city-siders heading over to Takapuna and back, we are planning a couple of multi-modal pilgrimages with bikes via ferry to Bayswater and Devonport between 5-6pm, so check out the map attached and follow our new (for Auckland) Frocks on Bikes – Auckland facebook event page for updates. Registration is essential so drop a quick line with your name and that of your friends also attending to zane.bray@aucklandtransport.govt.nz to register (especially to secure your food and bev, or if you don’t have a bike and need to get over to the Shore and back). Can’t wait to share a fun night with you on Wednesday. Bring a shower jacket in case it sprinkles a bit 09-style. 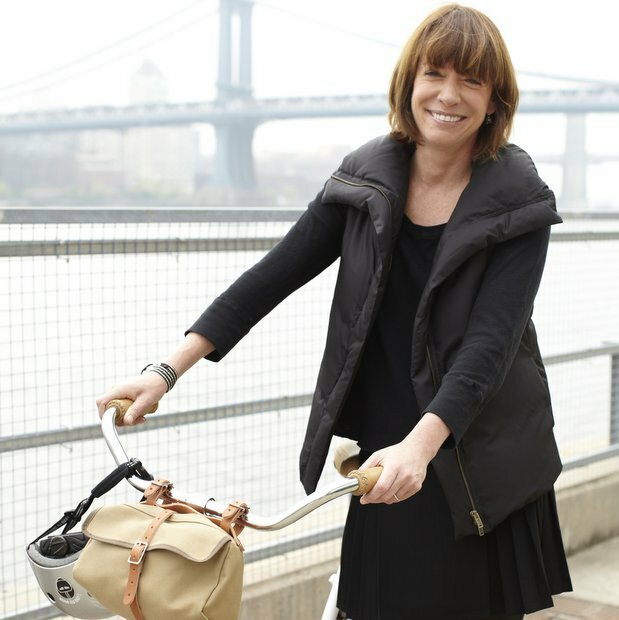 Frocks on Bikes is delighted to welcome to town New York’s transport revolutionary Janette Sadik-Khan, with a frockalicious bike tour along central Auckland’s scenic paths and shopping streets on Saturday 24th May. Dress Code: Frocks or your normal, everyday clothes! New York City’s former Department of Transportation Commissioner worked miracles during her tenure under Mayor Michael Bloomberg. Her team transformed many of NYC’s ‘mean streets’ to increasingly friendly shared spaces with innovations such as a pedestrian mall in Times Square, and more than 480km of new bike lanes. Now, as Transportation Principal at Bloomberg Associates (alongside her former boss), she is inspiring other cities to create “complete streets” with space for everyone, whether they are on foot, on bike, in buses or cars, and Frocks on Bikes are thrilled to be able to share their experiences of cycling in Auckland with Sadik-Khan. Frocks on Bikes, which began in Wellington in 2008 and now has 13 “frock flocks” across New Zealand and Australia, celebrates the casual chic and cheerful freedom of women on bicycles. “Our philosophy is you can ride however often you want, at whatever speed you like, in whatever you love to wear – yes, even a frock!” says Auckland Frocks on Bikes co-ordinator Nic Williams. Safety is not the only benefit. New York studies show that bike-friendly streets are great for retail and real estate: Manhattan’s 9th Ave retailers experienced sales increases of 49% after a protected bike lane went in. Potential bike lanes on Auckland’s shopping streets such as Karangahape and Ponsonby Roads are guaranteed to have the same positive retail impact. With baskets and panniers typical on the springy, upright commuter bikes we like to ride, Frockers are well-placed to shop, shop, shop. And then there’s our health. European studies show that women (and men) who cycle for just 30 minutes a day sleep better, look healthier, think better, concentrate more, live longer, save more money and lower their risks of heart disease and cancer. The best part? Most of this research is based on studies of moderate cycling, the kind of cruisy, pleasant cycling that Frocks on Bikes loves best. However, says Williams, yet more research concludes that to get more women out cycling, streets must be transformed into bike-friendly avenues. Frocks on Bikes are looking forward to rolling along some of central Auckland’s magnificent ridgeline roads with Janette Sadik-Khan, and hearing her thoughts on how our city can improve our streets for all the people who use them. Auckland Council, who is hosting Sadik-Kahn will also have a video recording of her free talk on Monday 26th May (now at full capacity) – posted to the Auckland Conversations website. Read more about Frocks on Bikes Auckland. 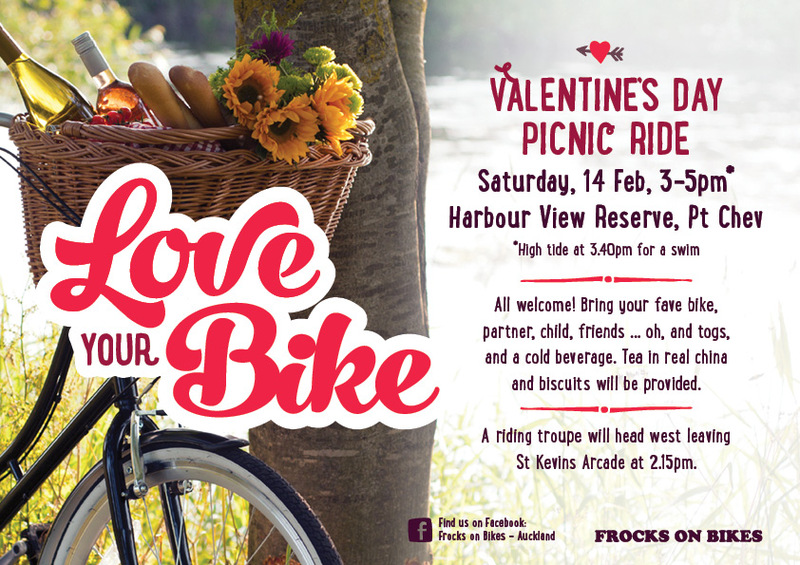 For those sweet on bicycles: come enjoy a leisurely ride around historic Devonport, then spread out on a picnic rug for afternoon tea at picturesque Cambria Reserve. A perfect post-Valentine’s Day treat to share with someone special. Afternoon tea included. Tweed is so the thing for all our frockfabuloso peeps out there. It is sweeping the globe as the ‘must do’ cyclecentric event and is soooo ‘now’. 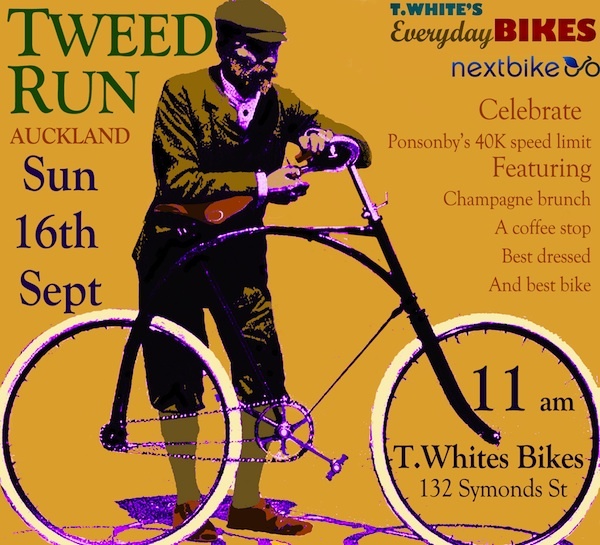 What’s more, the Auckland tweed run starts with brunch … how can you resist. the ride will then take a leisurely route through the Grey Lynn/ Ponsonby area with a stop for a trim cappi frappy latte coffee … in ponsonby, of course! The National Council of Women Auckland Branch have very kindly invited Frocks on bikes to join the Suffrage Day celebrations at the Auckland Suffrage Memorial in Khartoum Place (that’s just off Lorne Street in the Auckland CBD). What: A range of speakers, entertainment, activities, bagpipes and camelias – wow that sounds good! you really can’t beat the combination of bagpipes and camelias. ALSO The fabulous mezzo-soprano Mary Newman-Pound will sing … gorgeous, gorgeous, gorgeous.